DATE/TIME: Wednesday, December 26, 2018, 5:10 p.m. – 8:35 p.m.
VICTIMS: Peter Muffoletto, 30 years old, resident of Berkley, Ca. On December 26th, 2018, at approximately 5:10 p.m., San Bernardino County Sheriff’s Aviation responded to a report of an injured hiker at the Joshua Tree National Monument. The hiker, later identified as Peter Muffoletto, was rock climbing when he fell approximately 50 feet and sustained serious non-life-threatening injuries. Due to his injuries, he was unable to hike out from the location. Joshua Tree park rangers and fire department personnel hiked up to Muffoletto and requested air support from Sheriff’s helicopter Air Rescue 306 for a hoist rescue. Ground personnel were unable to safely carry Muffoletto out of the area due to the steep mountainous terrain. A Sheriff’s patrol helicopter arrived on scene and located Muffoletto out with fire personnel. The patrol crew conducted a scene size up and directed Air Rescue 306 to the location. Once on scene, the crew of Air Rescue 306, which is staffed with Sheriff and Fire personnel, experienced extremely high winds while they lowered the rescue medic 100 feet down to the victim. 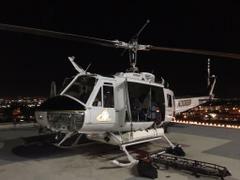 The crew conducted the hoist while utilizing night vision goggles. Muffoletto was secured into a rescue basket and was hoisted up into the helicopter, followed by the medic. Muffoletto was flown to a local trauma center for further medical treatment.